Palomino Labs unlocks the potential of software to change people and industries. Our team of experienced software developers, designers, and product strategists can help turn any idea into reality. Drew’s expertise lies in high-traffic web services, big data, and building hyper-efficient software teams. At Clearspring, Drew created and supported APIs that handled more than 6 million daily requests, monitored detailed metrics from processing clusters with hundreds of nodes, and delivered thousands of events per second to users in real-time. Drew is skilled in systems administration and takes automation seriously, applying the Unix adage "if you do it twice, you're doing it wrong" ruthlessly. As a certified Scrum Master, Drew worked alongside Ryan to build a kaizen-based development organization at Genius.com capable of delivering high-quality products as-promised and on-time. Drew spends his time away from computers lifting heavy things and racing cars that are well past their prime. Docker is a lightweight framework for containerizing applications. Employing the Linux cgroups, Docker allows containers to be run in a virtual environment that is completely isolated from the host system and other containers, without the overhead of hardware virtualization. It’s a lot like chroot applied not only to filesystems, but also the process and memory space. The Docker community is full of wide-eyed idealists who see the world as a place of default configurations and simple use cases using only the latest things. The Docker examples include Node.js, CouchDB, and Riak, among others. No mention of, say, Rails, despite it being one of the most popular frameworks over the past 5 years. I’ll try to fill that void. This blog post is an introduction to Docker for folks who use Rails. You don’t have to know anything about Docker, but you do need to know how to get a Rails app running. I’ll walk you through setting up Docker for development on a Mac, creating a Dockerfile, and running that Dockerfile on your development Docker host. We have a Java application that runs on Heroku and interacts with the Salesforce API. Salesforce enforces strict security on the usage of their API by limiting access to a set of IPs that are white-listed by an organization’s administrator1. This is a bit of a snag, since Heroku abstracts away the existence of servers, so the IP address from which requests emanate can and will change. As an alternative to running your application within their wrapper, Proximo offers some examples of using it as an HTTP proxy, though they don’t provide an example for doing this in Java and for all my trying, I couldn’t get this to work globally through my Java application. Java 8 is on its way, bringing a host of new features to the most widely-used language on the JVM. Likely the most oft-noted feature will be lambdas, to which Scala and JRuby aficionados will release a sigh of “finally”. Less flashy, but very important to certain classes of multithreaded applications, are the addition of LongAdder and DoubleAdder, atomic Number implementations that provide superior performance to AtomicInteger and AtomicLong when under contention from multiple threads. Some simple benchmarking illustrates the performance difference between the two—for the following benchmarks we used an m3.2xlarge EC2 instance, which provides access to all 8 cores of an Intel Xeon E5-2670. With a single thread, the new LongAdder is one third slower, but when threads are in contention to increment the field, LongAdder shows its value. Note that the only thing each thread is doing is attempting to increment the counter—this is a synthetic benchmark of the most extreme kind. The contention here is higher than you’re likely to see in most real-world apps, but sometimes you do need this sort of shared counter, and LongAdder will be a big help. Amazon regularly adds new types of EC2 instances to keep up with demand and reflect the capabilities of the underlying hardware. This week they announced medium & large instances in the M3 class. Like the other M3 instances, these VMs are backed by Sandy Bridge or Ivy Bridge processors and SSD instance storage; more details on Amazon’s instance types page. 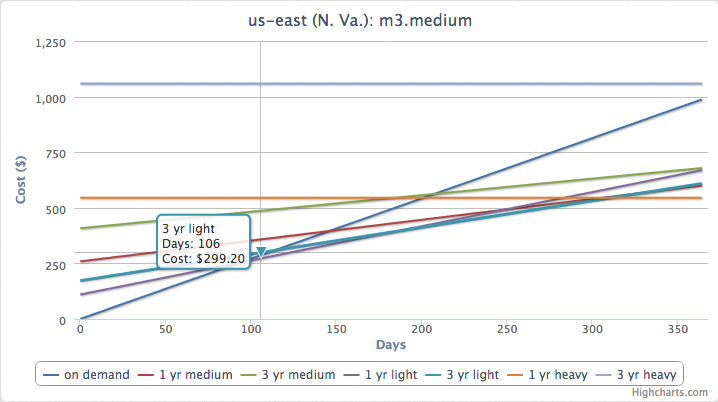 Last year we created a tool to make comparing the price of EC2 instances easier. With the advent of these new instance types, we’ve updated WhichInstance.com to reflect the new options, improving the interface a bit in the process. Give WhicInstance a look to more easily understand the costs of running an instance over time, and remember that Amazon reserved instances can save you a lot of money! We’re strong believers in testing of all sorts. Unit testing ensures that each of your classes and functions does what you expect, in particular at edge cases. Functional tests provide a check that entire systems work from a user point of view. Thanks to test frameworks like RSpec, JUnit, and Jasmine, unit tests are usually easy to create and run, since they depend upon nothing beyond the component being tested. While there are similar tools for creating functional tests (namely, Selenium for testing webapps), running the test can be much more complicated if you have multiple parts to your application. At Palomino Labs, we recently completed a project that involved two main pieces: a webapp written in Rails and a data storage application in Java. In our scenario, a portion of the webapp’s functionality depended upon being able to communicate with the running Java app. In the development environment, this is a minor nuisance, requiring the developer to have the Java application running. Running the test automatically using Jenkins was a bigger problem, and since we know that automated testing is integral to catching regressions quickly, the problem needed to be solved. One option would be to have a long-running version of the Java service available to the Jenkins box, but that would far from ideal because we want to make sure that the versions of the Java and Rails projects that are used for testing stay in sync with each other. Instead, we have Jenkins start and stop a fresh, up-to-date instance of the Java service for every test run. Encryption is one of the more obtuse things that we do as programmers, perhaps appropriately so. Regardless of the language, search results are guaranteed to provide a myriad of different strategies, each describing different methods, many of which are subtly flawed, subverting their security goals. As is Java’s nature, performing encryption requires more programmatic steps than higher level languages, increasing the difficulty for those using encryption in their application. First, let’s take a look at what we’re going to do here. This post covers symmetric encryption, wherein a single key is used for encryption and decryption. In such a system there is a single thing, the encryption key, that must be kept secret and shared between anyone wanting to encrypt or decrypt data. In our example, we are also using a message authentication code (MAC), which requires its own key that must be secret & shared. Pieces of information like these are appropriately called shared secrets. The MAC ensures that the outputs of our encryption (namely the ciphertext and initialization vector) have not been altered. It is theoretically possible to alter the initialization vector (IV) and ciphertext in concert to change the message without knowing the secret key. Additionally, either of those pieces could be manipulated so as to cause a fault when they are fed into the decryption system, causing an unexpected exception in your decryption system. Apache ZooKeeper is a powerful system for managing distributed systems. While ZooKeeper’s power is great, and the developers even provide recipes for common use cases, it is perhaps masked by the extreme flexibility and complexity of the system. Thankfully, the folks at Netflix have implemented many of the aformentioned recipes in their Curator framework. The only lacking bit of Curator is documentation—the wiki has a lot of information, but is inscrutable for a beginner. This post intends to simplify the introduction to using Curator for service discovery. This is not a cut & paste tutorial for using Curator, but rather a summariztion of how we implemented Curator in BenchPress. While the class names are unchanged, their content is simplified. Pull up the BenchPress code for further detail on employing Curator’s Service Discovery. Jackson is a mainstay of Java web development, providing JSON serialization & deserialization to Jersey, RestEasy, and Hadoop, among many more. Jackson can be easily integrated into most applications through the use of its data-binding annotations—simply mark fields to serialize with @JsonProperty and Jackson will happily create & read JSON representations of your object when you hand them to an ObjectMapper. Sometimes, though, you don’t have access to or don’t want to modify the source of an object that you want to use with Jackson. In these cases, you can write a custom module to provide Jackson with the information it needs to (de)JSONify your objects. Since our application employed the Joda data type extensions module for Jackson, this error seemed curious, but looking into that project it became clear that translation is not provided for all of the Joda data types. Duration is an exceedingly simple object (it can be represented as a number of milliseconds), so writing our own serializer & deserializer is an easy endeavor.